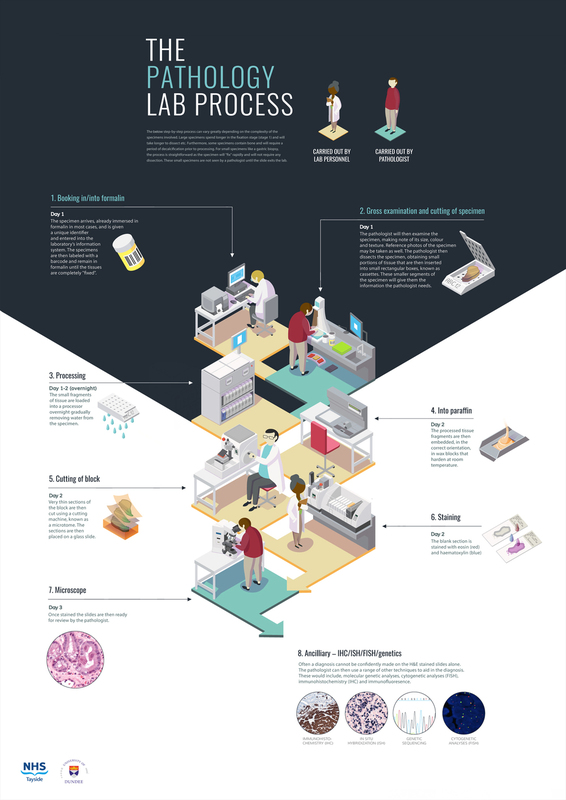 A STEP-BY-STEP VISUAL STORY THAT TAKES THE VIEWER THROUGH THE PATHOLOGY LAB PROCESS. Cut specimens are placed in small, labelled containers called cassettes. Processed tissue fragments are taken out of the processor and cassettes and transferred to a tissue embedding station. Wax blocks are then transferred to a microtome station. Specimen segments are then embedded in paraffin wax blocks that harden at room temperature. The microtome cuts the wax blocks into extremely thin slices. Thin specimen slices are placed on a slide and put through an automatic slide coverslipper before being put through a stainer. The specimen slides are stained with eosin (red) and haematoxylin (blue). Once stained the slides are then ready for review by the pathologist through a microscope. They will then be able to make a diagnosis or undertake further techniques to aid in diagnosis. Each year new medical and life sciences students enter the hospital's pathology lab to learn about their step-by-step process on how they process specimens and obtain results. Dr. Oparka, also the teaching lead of pathology, was looking for a visual resource that illustrates each step. This was when he came to us to discuss the possibility of creating a poster that's not only educational but also fun and eye-catching for his student audience. We proposed that we go with a flat illustrative style that can not only illustrate the various steps needed but keep the overall design clean as well as effectively outline each step. 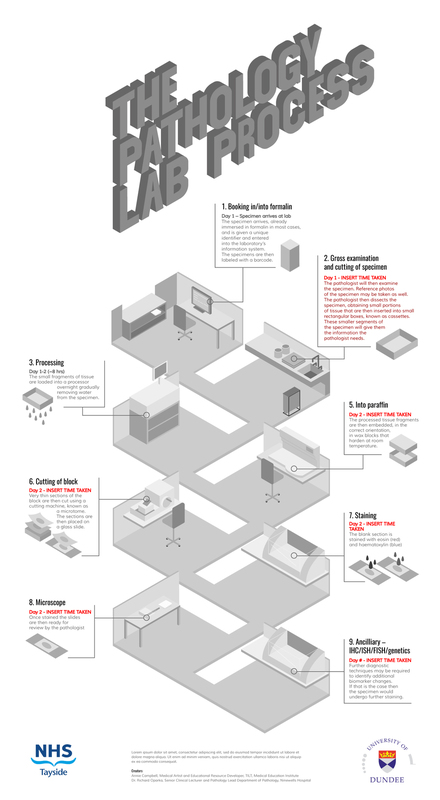 This poster is available for your lab walls and educational uses HERE.